According to article 43 of the Palestinian Child Law No (7) of 2004, “It is prohibited to exploit children for begging, and it is likewise prohibited to employ them under illegal conditions, or to assign them to render jobs that interfere with their schooling, or affect their physical and psychological health”, and article 44 of the same law which prohibits exposing the child to seven cases including “5. Sexual or economic exploitation organized crime, and begging”. On 18/11/2018, MUSAWA received a complaint from an advocate from Gaza, in which she stated that she was verbally insulted by a group of children beggars and their families in the area of Ramzor Alsaraya, where she was working on documenting the organized begging phenomenon in the area. The complainant added that the insult occurred before the eyes of the police officers, who were present in the area. However, they watched the abuse in complete silence, without interfering to ensure the physical protection of the complainant or to facilitate her authorized task, noting that the lawyer obtained an oral authorization from the police officers, who in their turn had inspected her mobile for security purposes. In its turn, MUSAWA sent a legal memo to the Attorney General in Gaza, Adviser, Diaa Al-Madhoun, in which it pointed out the physical and verbal assaults the complainant has been through, which occurred before the eyes of the police officers, who granted her the authorization to take photos, and as mentioned before, they watched the abuse in complete silence. The legal memo indicated the deficiency in the police performance concerning the seizure of begging groups or providing physical protection, who was attacked before their sights. MUSAWA also indicated the seriousness of the growing phenomenon of child begging, which serves as a fertile breeding ground for crime and violates the humane dignity of children, which represents a social, cultural, and psychological threat that negatively affects the children present and future. Through the legal memo, MUSAWA has called the decision makers, the representatives of parliamentary blocs, and the political parties to make a serious reaction against this phenomenon, and to take all needed administrative and penal actions to eradicate and limit the phenomenon, and to hold the ones responsible of it accountable, as well as to organize academic and media awareness-raising campaigns to identify the phenomenon’s threats and negative impact on children in specific and the whole community in general. In addition, it has been asserted the importance to address the socio-economic root causes of the begging phenomenon. MUSAWA has also demanded to take the needed legal action to hold the police officers, who ignored the abuse of the complainant, accountable, and to start the investigation on the begging contractors, and refer them to the judiciary to charge them duly. On 15/1/2019, MUSAWA received a letter from the Attorney General in Gaza, Adviser, Diaa Aldeen Al-Madhoun, affirming that the Public Prosecution is committed to respecting human rights, and appreciating MUSAWA’s collaboration in this area to uphold the justice and the rule of law. In addition, the Attorney General in Gaza affirmed that a number of actions are to be taken to face the child begging phenomenon. 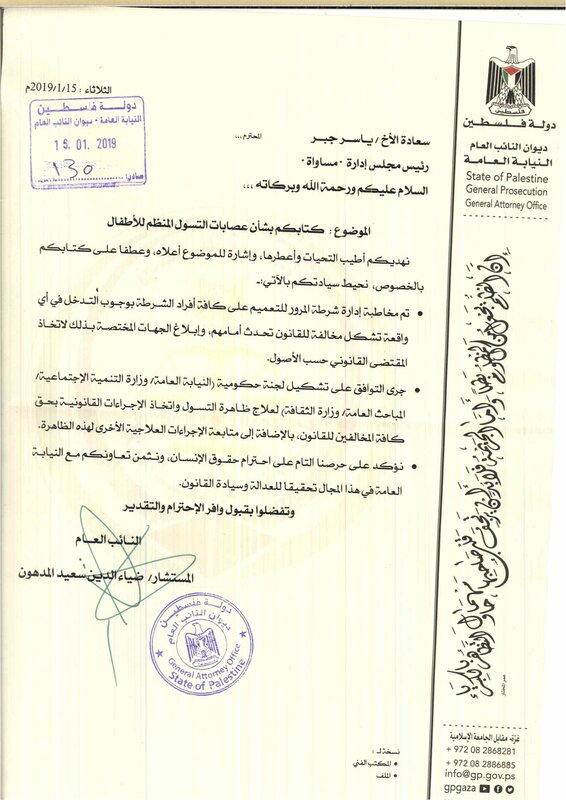 These actions include ordering the Traffic Police administration to inform all police members that they must interfere in any incident that represents a violation of the Law in case it happens before their eyes and call the competent bodies to take the needed legal action duly, in addition to deciding on forming a governmental committee composed of the Public Prosecution, the Ministry of Social Development, the General Intelligence and the Ministry of Culture, to address the begging phenomenon and take the legal action against law violators, and to follow up the other remedial actions concerning this phenomenon. Whereby MUSAWA welcomes the commitment of the public prosecution in Gaza to address the child begging phenomenon, the center also indicates the importance of respecting children’s rights and protecting them from any violations that should prejudice their humane dignity during the process of dealing with the phenomenon, and to make sure that none of their rights gets violated, as well as to make their interest the priority of all the actions. Finally, MUSAWA demands to publish the results of the work of the committee mentioned in the letter sent by the General Attorney in Gaza, and to keep us updated with the actions taken by the General Attorney in Gaza and the competent bodies in this regard.